Easy, non invasive approach for spinal stabilization and postural control. Improved ability to complete activities with less discomfort. Decreased co-morbidities from immobility. Increased confidence & outlook. This device has been approved by PDAC for billing under the L0631 code. Click here to view our BalanceWear Measuring Guide video. Click here to view HCPCS Coding Verification Letter. Sagittal control with rigid anterior and posterior panels contained within the device. A rigid posterior panel that extends from the sacrococcygeal junction to the ninth thoracic vertebra. Effective mid-lower back treatment while reducing pressure at the disc and vertebrae. Rigid Thermoplastic Inserts that can be heat molded or trimmed. 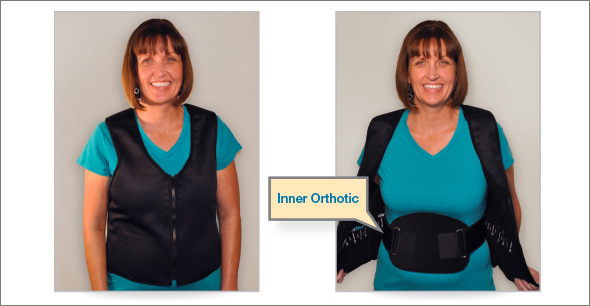 An interior compression belt that is connected to the rigid anterior and posterior panels and when tightened, provides intracavitary pressure to reduce the load on the intervebral discs. An athletic fashionable outer garment that provides compression and kinesthetic awareness of the trunk. A modular dynamic system designed to give the client maximum control in all phases of rehabilitation. Recent surgical incisions unless authorized by physician.